In late 1959, when Bill Koshland showed our manuscript to the editors at Knopf, it was Judith Jones who immediately understood what we were up to. She and Evan tried out a few of our recipes at home, subjecting our work to the operational proof. They made a boeuf bourguignon for a dinner party. They used our top-secret methods for making sauces. They learned to make and flip an omelette the way Bugnard had taught me (they practiced the omelette flip using dried beans in a frying pan, as we had suggested, on their little deck; the following spring, they discovered beanstalks sprouting from their roof). They avidly read our suggestions on cookware and wine. Angus Cameron, a Knopf colleague who had helped to launch the Joy of Cooking at Bobbs-Merrill years earlier, agreed, and together they hatched up all kinds of promotional schemes. We have spent months over [your] superb French cookbook . . . studying it, cooking from it, estimating, and so on, and we have come to the conclusion that it is a unique book that we would be very proud to have on the Knopf list. . . . I have been authorized to make you an offer. . . . We are very concerned about the matter of a title because we feel it is of utmost importance that the title say exactly what this book is which distinguishes it from all the other French cookbooks on the market. We consider it the best and only working French cookbook to date which will do for French cooking here in America what Rombauer’s THE JOY OF COOKING once did for standard cooking, and we will sell it that way. . . . It is certainly a beautifully organized, clearly written, wonderfully instructive manuscript. You have already revolutionized my own efforts in the cuisine and everyone I have let sample a recipe or talked to about the book is already pledged not to buy another cookbook. I blinked and reread the letter. The words on the page were more generous and encouraging than I ever dared dream of. I was a bit stunned. When Avis called us transatlantic, she gave a big “Whoop!” and assured us that Knopf would do a nifty printing job and would know how to really publish the book the right way. It turned out that Mrs. Jones had never edited a cookbook before. Yet she seemed to know exactly what she liked in our manuscript and where she found us wanting. She enjoyed our informal but informative writing style, and our deep research on esoterica, like how to avoid mistakes in a hollandaise sauce; she congratulated us on some of our innovations, such as our notes on how much of a recipe one could prepare ahead of time, and our listing of ingredients down a column on the left of the page, with the text calling for their use on the right. But she felt that we had badly underestimated the American appetite. “With boeuf bourguignon,” she noted, “two and a half pounds of meat is not enough for 6–8 people. I made the recipe the other night and it was superb, so much so that five hungry people cleaned the platter.” Of course, our servings had assumed that one was making at least a three-course meal à la française. But that wasn’t the American style of eating, so we had to compromise. My own suggestion was La Bonne Cuisine Française. Judith felt this wouldn’t do, as a French title would be “too forbidding” for the American reader. Some of the other early contenders included French Cooking from the American Supermarket, The Noble Art of French Cooking, Do It Yourself French Cooking, French Magicians in the Kitchen, Method in Cuisine Madness, The Witchcraft of French Cooking, and The Passionate French Cook. As the apple trees blossomed in Oslo, and Paul and I started to grill outdoors, we debated the merits of poetic titles versus descriptive titles. Who could have predicted that the Joy of Cooking would become just the right title for that particular book? What combination of words and associations would work for our tome? We made lists and lists—The French Chef ’s Companion; The Modern American’s Guide to French Cooking; How, Why, What to Cook in the French Way; Food-France-Fun—but none seemed to be le mot juste. Finally, on November 18, 1960, she wrote me to say that she’d settled on exactly the right title: Mastering the Art of French Cooking. At the eleventh hour, Simca declared that she did not care for the title. “It’s too late to change it,” I said, adding that only an American ear could catch the subtle nuances of American English. Plus, I said, Knopf knew a lot more about books than we did, and they were the ones who had to sell it. So, in effect, tant pis! 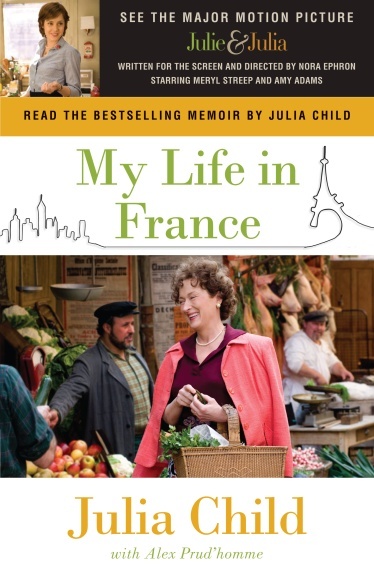 Excerpted from My Life in France (Movie Tie-In Edition) by Julia Child with Alex Prud’homme. Copyright © 2009 by Julia Child. Excerpted by permission of Anchor, a division of Random House, Inc. All rights reserved. No part of this excerpt may be reproduced or reprinted without permission in writing from the publisher. Julia Child and Alex Prud’homme photo credit: ©Sara Prud’homme.